The first step towards full OGP participation is meeting the OGP eligibility criteria. In order to be eligible to participate in OGP, governments must demonstrate a minimum level of commitment to open government principles in four key areas (Fiscal Transparency, Access to Information, Asset Disclosures, and Citizen Engagement). A country is eligible to join the OGP if it meets those criteria measured by objective governance indicators using public data sources. To participate in OGP, countries must score at least 75% of the total possible points available to them. For a detailed explanation of eligibility criteria and how countries are scored to determine eligibility as well as a list of eligible countries please click here. Questions about OGP eligibility can be directed to the Support Unit by emailing info@opengovpartnership.org. If a country meets OGP eligibility criteria, the government should signal its intent to participate in OGP by sending a letter to the OGP Co-Chairs with copy to the OGP Support Unit. The letter of intent formally expresses the government’s intention to join OGP and commitment to respect the open government principles articulated in the Open Government Declaration. The letter of intent will be published on the OGP website. 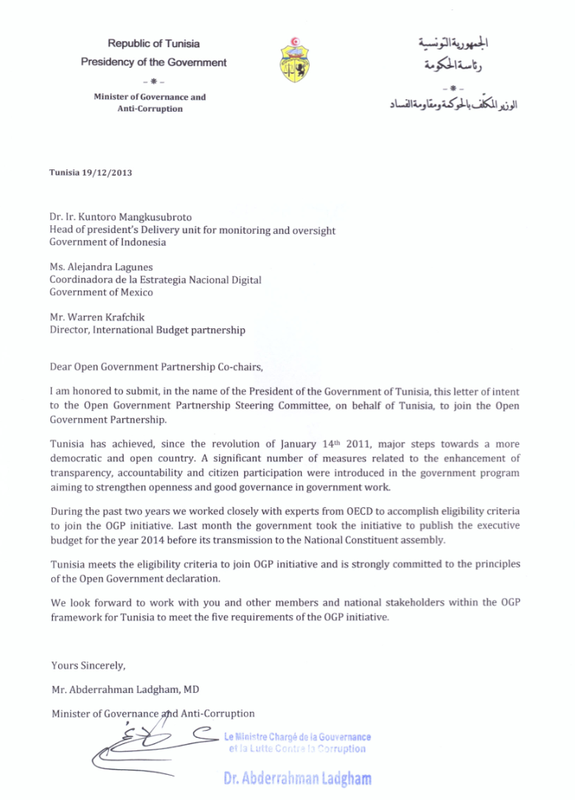 In terms of content, the letter should confirm that the government is eligible to join OGP, specifically endorse the Open Government Declaration, describe past open government reforms, and specify the individual that will be responsible for OGP within the government. Examples of past letters can be found on individual country pages, and a recent example is from Tunisia. This letter can come from any agency within government, as long as that agency has received approval from the Head of State to join the initiative. The letter should be signed by a Ministerial-level official. Please send all letters to the following address: joe.powell@opengovpartnership.org, please copy zsanikidze@justice.gov.ge and info@opengovpartnership.org. A member of the the Support Unit’s Government Support and Exchange Team will connect with your government’s designated representative soon after receiving the letter in order to answer any questions and provide an orientation to OGP. The Support Unit will also connect the government representative with relevant technical experts or other resources. The Support Unit recommends the official point of contact is a senior civil servant in a function that typically coordinates across government. Chapter one of the OGP government points of contact manual describes the responsibilities of the point of contact (English, Spanish, and French). National Action Plans are at the core of a country’s participation in OGP. They are the product of a co-creation process in which government and civil society define ambitious commitments to foster transparency, accountability and public participation. Chapters 2 and 3 of the OGP government points of contact manual describe the process for developing a National Action Plan. Countries are only considered to be officially participating in OGP once the government has started to consult with civil society organizations and develop a national action plan. The Support Unit recommends that government and civil society agree on a timeline for developing the action plan soon after first meeting, and that the timeline should be published. At the start of this process, governments are also strongly encouraged to set up a permanent mechanism to facilitate ongoing consultations with civil society and opportunities for public input. Guidance on how to develop that mechanism is here (additional guidance on consultations is here). OGP’s model does not require civil society organizations to join through a formal process as governments do. Instead, organizations or individuals should find their own ways to become active in OGP through the global community, national dialogue, or both. Steps for getting involved at the national level are listed below, and also on this page. Individuals or organizations can also sign up for updates and the civil society mailing list here. Drafting the first action plan: Provide input to the government on establishing an effective consultation process. Participate in the consultation process by preparing concrete, prioritized commitments and commenting on the draft action plan. Implementation: Work with the government to set up an ongoing mechanism for civil society to support and provide feedback on implementation of OGP commitments. Independent monitoring: Provide input on the government self-assessment report and the Independent Reporting Mechanism research process; work with civil society partners to comment on these reports and/or prepare a parallel, independent assessment of the OGP.